I usually buy good quality WD necks from Atlantic Custom Guitars because they level and polish the frets and send them with a nice Tusq net, ready to use. For this test I decided to try a cheap eBay neck for $33.25 from China. It has a thin urethane finish, but the price isn't the issue as the maple should still age like a $300 neck:. 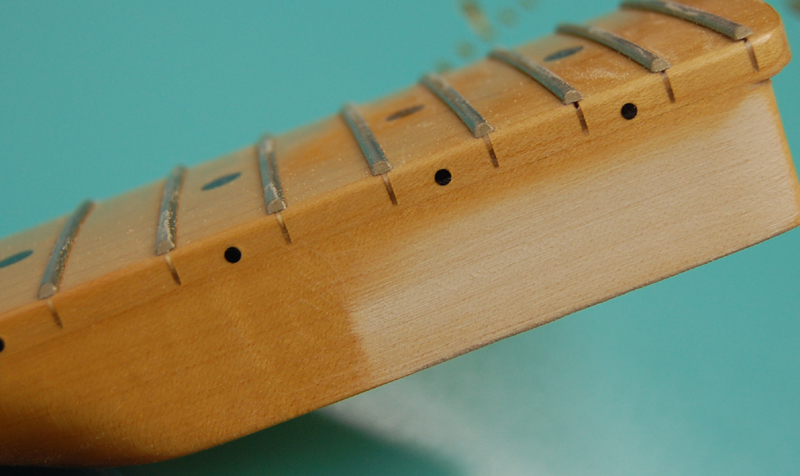 Truth be told, it isn't a bad neck, although it lacks the fret leveling and cleaning that you would expect from a better seller. I'm going to pair this up with the Daphne guitar body I bought from Guitar Fetish, along with some nice Gretsch humbuckers. Most of the necks I buy are not maple fretboards, which is another reason I bought this one. It isn't a one piece, as the fingerboard is glued on just like a rosewood would be, but it looks good and feels about like a made in Mexico Fender, slightly sharp frets, etc. Not great, but not bad. I ordered some equally cheap tuning machines for it, and while they cross the Pacific, I put the neck in my standard UV aging rig. This neck has a very thin finish, but you need to understand that the thicker the finish, the slower it will age, which is why I always choose thin finishes for aging, then add more finish later. It is actually helpful to have a thin sealer or coat of finish on the wood, rather than being dry. This prevents it from drying out to much and raising the grain. Here are some photos, which probably tell the story better than I can. This is what the neck looks like just before aging it. I will update the photos with the after images in a couple of weeks. This is in my lower power rig, which uses 6 lamps but is only 32w per lamp. I use this rig for a lot of testing. This is the headstock of the guitar after just two days of aging in my lowest powered rig. Essentially, pushing 32w to a lamp designed to run 40-80w. You can already see the caramel coloring coming out. This is shot through the thin urethane finish, which slows it down a bit. The biggest advantage is obvious here: Unlike a tinted finish that hides the grain because it has suspended particles blocking the real wood, what you see is 100% real, 100% wood, 100% natural grain. It doesn't look fake and instead just looks old but in perfect condition. 3 days of aging in a low power rig. You could do this in under 2 days with a SunHorse ballast. Again, 3 days in a low power rig. It isn't just about how dark it is, which is it much darker. It is about the warmth, the character, and this is without any real finish on it. Unquestionably, this looks much better, much more expensive, much older and is just asking to be picked up and played. And this is just a $34 guitar neck, as cheap as they come. Imagine what it will do to a high quality neck. Best of all, there are NO dyes, nothing that obscures the grain, so it comes through naturally. This was too good a shot to not share. I'm having to shave the neck a bit to get it to fit in the guitar body. There is only clear nitro on the neck, with NO tinting. This means you get to truly see the before and after for this neck. Unquestionably, aging it a few days made a huge difference in the tone and warmth without obscuring the grain.